It’s Your Lucky Day – A St. Patrick’s Day Freebie!! 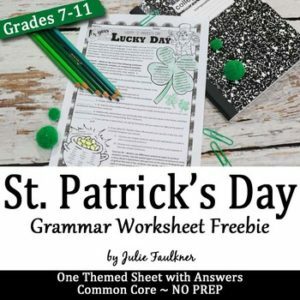 This grammar worksheet is a sampling of my seasonal grammar worksheets that aren’t your typical grammar exercises with sentences about the holiday! They are grammar challenges that reflect the seasonally-inspired thematic concept of the page. I’ve also provided beautiful clip art to add layers and interest to the pages to grab your teens’ eyes! Plus, for those fast finishers, there’s plenty for them to color and style! Extension activities are also provided on several of the sheets, and the grammar notes are included as well. Each worksheet covers a different – and single – grammar skill. WAIT! See my seasonal grammar worksheets full-year BUNDLE! Looking for more festive grammar and language assignments?